St. Louis, MO - April 22, 2009 - Amdocs Limited (NYSE: DOX) today reported that for its fiscal second quarter ended March 31, 2009, revenue was $711.1 million, a decrease of 8.2% from last year's second quarter. 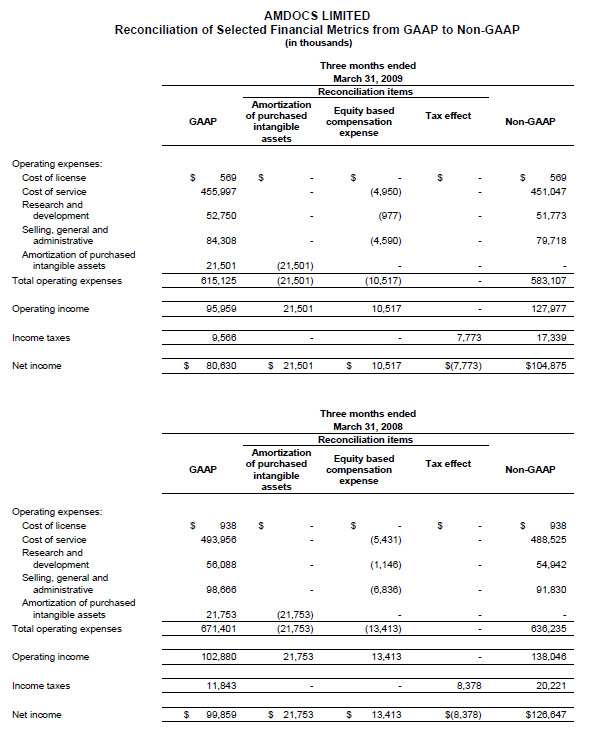 Net income on a non-GAAP basis was $104.9 million, or $0.50 per diluted share, compared to non-GAAP net income of $126.6 million, or $0.58 per diluted share, in the second quarter of fiscal 2008. Non-GAAP net income excludes amortization of purchased intangible assets and equity-based compensation expenses of $24.2 million, net of related tax effects, in the second quarter of fiscal 2009 and excludes such amortization and equity-based compensation expenses of $26.8 million, net of related tax effects, in the second quarter of fiscal 2008. The Company's GAAP net income for the second quarter of fiscal 2009 was $80.6 million, or $0.39 per diluted share, compared to GAAP net income of $99.9 million, or $0.46 per diluted share, in the prior year's second quarter. "In the second quarter of fiscal 2009 difficult economic conditions continued to impact our customers' buying decisions. Sales cycles remained extended, particularly for larger, transformational projects, and certain customers delayed commitments for new projects. We had anticipated operating in a difficult environment during the quarter and are pleased with our execution in sales, cost control and cash collections. Our second quarter revenue of $711 million and diluted non-GAAP earnings per share of $0.50 were in-line with our guidance, and we delivered on our 18% non-GAAP operating margin target for the quarter," said Dov Baharav, chief executive officer of Amdocs Management Limited. Baharav continued, "For the third quarter of fiscal 2009, Amdocs expects that revenue will be approximately $670-$690 million as we anticipate on-going weakness in the economic environment. We are managing our expenses under the assumption that revenue for the year could be down 10%-12% relative to fiscal year 2008, with foreign currency effects contributing roughly 3% of the decline. While we cannot yet provide a precise range for our fourth quarter revenue expectations, at this time we believe that fourth quarter revenue is likely to decline sequentially from third quarter levels." Baharav concluded, "While these are difficult times for our industry and for Amdocs, we signed a number of important deals in the second quarter which position us well with some key customers. We are managing expenses to protect profitability and cash flow and we are investing in our future, including in R&D, so that we can continue to provide the best products and services to our industry. We believe we are well-positioned for growth when economic conditions improve." In the second quarter Amdocs won new business with existing customers and new logos. These wins include new business in each of Amdocs' four focus areas for growth: cable/satellite, managed services, emerging markets and OSS, including the examples below. Amdocs signed a transformational BSS project based on the CES 7.5 portfolio with a major satellite provider in Asia-Pacific spanning billing, ordering, CRM, self-service and partner relationship management. Clearwire selected Amdocs for a multi-year agreement for the license and implementation of Amdocs CES 7.5 products and managed services to support Clearwire's retail and wholesale business. Instituto Costarricense de Electricidad (ICE), Costa Rica's national service provider of telecommunications, will implement Amdocs OSS 7.5 to support ICE's OSS needs, including planning, inventory and discovery, provisioning and activation, trouble ticketing, service fulfillment and service impact analysis. A mobile operator in Asia-Pacific selected Amdocs OSS to support its GSM network. Amdocs signed a new wireless customer in Africa for a pre-paid billing solution. Additionally, in North America, Amdocs won a significant new Amdocs Interactive project to support a wireless customer's on-portal digital content storefront including content management, commerce, discovery, and delivery, as well as a billing consolidation project for an existing wireline customer. 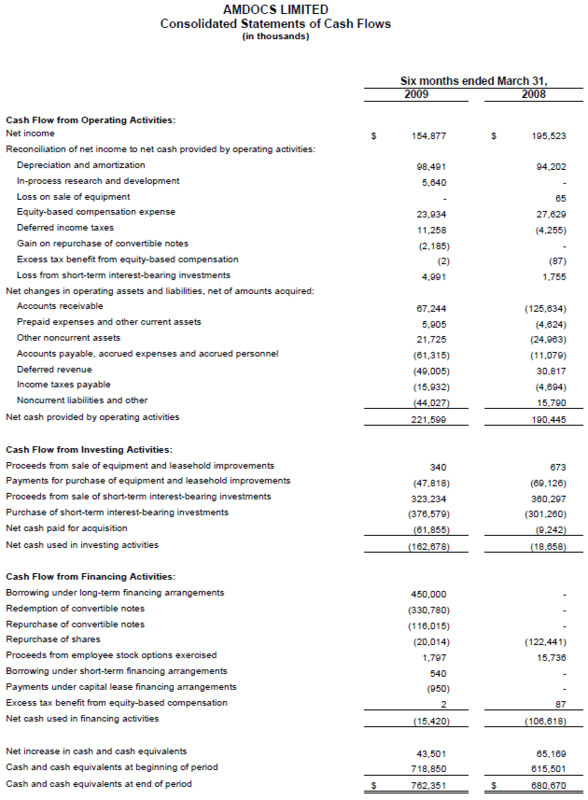 Free cash flow was $62 million for the quarter, comprised of cash flow from operations of $80 million less approximately $18 million in net capital expenditures and other. Included in the calculation of second quarter free cash flow was $52 million in annual employee bonus payments. Twelve-month backlog, which includes anticipated revenue related to contracts, estimated revenue from managed services contracts, letters of intent, maintenance and estimated on-going support activities, was $2.37 billion at the end of the second quarter of fiscal 2009. 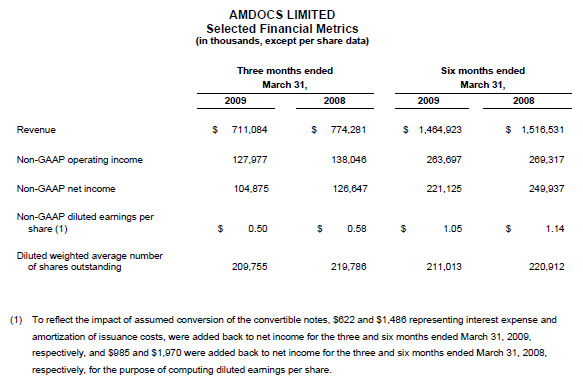 Amdocs expects that revenue for the third quarter of fiscal 2009 will be approximately $670-$690 million. 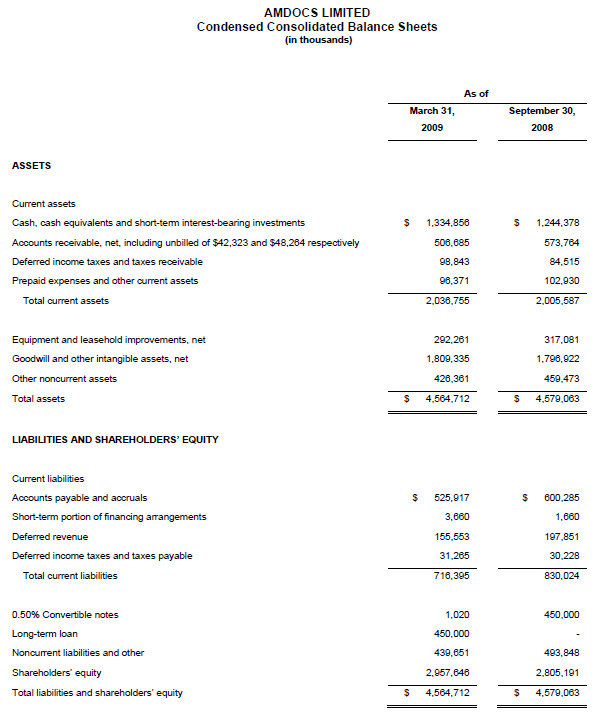 Amdocs expects diluted earnings per share on a non-GAAP basis for the third quarter to be $0.46-$0.50, excluding acquisition-related costs and approximately $0.04-$0.05 per share of equity-based compensation expense, net of related tax effects. 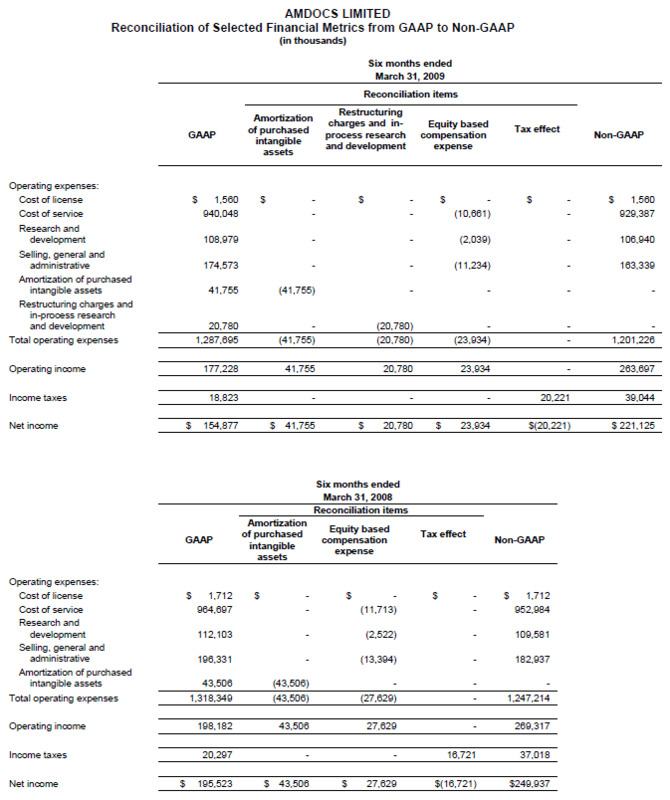 Amdocs estimates GAAP diluted earnings per share for the third quarter will be $0.33-$0.38. Amdocs will host a conference call on April 22, 2009 at 5 p.m. Eastern Time to discuss the Company's second quarter results. The call will be carried live on the Internet via www.InvestorCalendar.com and the Amdocs website, www.amdocs.com. Amdocs is the market leader in customer experience systems innovation, enabling world-leading service providers to deliver an integrated, innovative and the intentional customer experienceTM - at every point of service. Amdocs provides solutions that deliver customer experience excellence, combining the software, service and expertise to help its customers execute their strategies and achieve service, operational and financial excellence. A global company with revenue of $3.16 billion in fiscal 2008, Amdocs has more than 17,000 employees and serves customers in more than 50 countries around the world. For more information, visit Amdocs at www.amdocs.com. This press release includes information that constitutes forward-looking statements made pursuant to the safe harbor provision of the Private Securities Litigation Reform Act of 1995, including statements about Amdocs growth and business results in future quarters. Although we believe the expectations reflected in such forward-looking statements are based upon reasonable assumptions, we can give no assurance that our expectations will be obtained or that any deviations will not be material. Such statements involve risks and uncertainties that may cause future results to differ from those anticipated. These risks include, but are not limited to, the effects of general economic conditions, Amdocs ability to grow in the business markets that it serves, Amdocs ability to successfully integrate acquired businesses, adverse effects of market competition, rapid technological shifts that may render the Company's products and services obsolete, potential loss of a major customer, our ability to develop long-term relationships with our customers, and risks associated with operating businesses in the international market. Amdocs may elect to update these forward-looking statements at some point in the future; however, the Company specifically disclaims any obligation to do so. These and other risks are discussed at greater length in the Company's filings with the Securities and Exchange Commission, including in our Annual Report on Form 20-F for the fiscal year ended September 30, 2008 filed on December 8, 2008 and in our quarterly 6-K furnished on February 9, 2009.